1st Batch sparge; it looks like it is going to get stuck. Those darn oats! This page archives many of the Apartment Homebrewer brew days! Brew day post are intended to discuss extensive recipe design or introduce a specific brewing technique. Also, check out the recipes page for an archive of tasting notes, some recipe design, and a recipe. Cheers and happy brewing! Mayan Apocalypse Ale Brew Night : Brewing a strong ale of sorts while awaiting the 2012 Mayan Apocalypse! Naked Blonde Ale Brew Day : An experimental brew to find out what Simpson’s Golden Naked Oats contribute to beer character. Big Oatmeal Stout Brew Day : Pushing an oatmeal stout to its limits (according to the BJCP). Palisades American Bitter Brew Day : A brew day to find out what Palisades contribute to a Bitter type recipe. Falconer’s Flight APA Brew Day : A basic brew day of an American Pale Ale using solely Falconer’s Flight hop blend! Barrel-Aged Saison : French-style saison aged in a Jester King barrel. 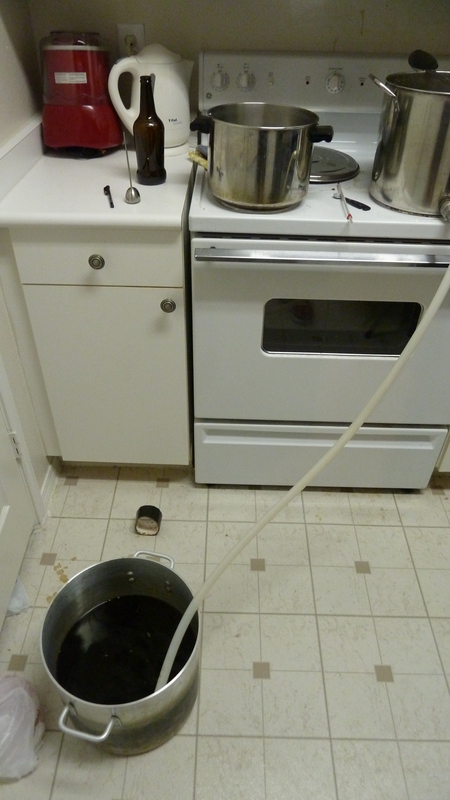 Craft A Brew Brown Ale Kit : Simply stated, a one-gallon extract batch of brown ale. Hi. Do you mind sharing your bond ale smash recipe? Should be brewing this soon, around mid July after my lager brewing finishes up. Hope this helps! Cheers! Going to think about this one… I have wanted to do a smash with Hallertau. I have to wait for my lite beer clone to finish so I can have my fermenter back. It needs another 7 days before I can add AE to it, then needs seven more days. Nice! Let us know if you do. Cheers! Thanks! Congrats on your first batch! What style did you guys brew up? Thank you! It’s a Smoked Vanilla Porter 🙂 Two more weeks. Although it’s so difficult to just let it sit there!